Replacement blade identified as 707-2-4. There is no damage. I need your zip code to calculate the postage. Vintage sharpener marked as Eversharp Knife Sharpener, Koos Co. New Haven, Conn. It is made for mounting on the wall or any place needed. It measures 2 7/8 x 1 1/2 inches. It needs cleaning and shows age related wear to the surface. Additional photos by email. I need your zip code to calculate the postage. 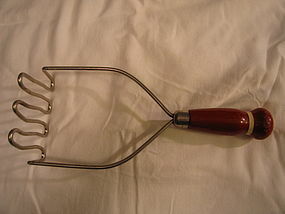 Vintage red and white wooden handle potato masher. It measures 10 inches in length. There is wear to the paint of the handle. I need your zip code to calculate the postage. 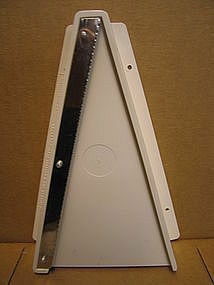 Metal rack or cradle Corning marked as P 10-M-1 with a measurement of 13 x 9 1/2 inches. It was made for the chicken fryer and electric skillet. There is no damage, but has a small area of discoloration on the bottom. I have other sizes available. When I picked this cover, I thought it was the top to a cooking pot, but the woman selling it, told me it was a cake cover. 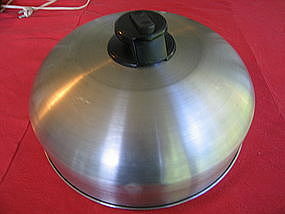 I thought is was a pan top, because the knob has a device to open and reveal a tiny round hole. The exterior looks like brushed aluminum, but I think it is stainless steel. 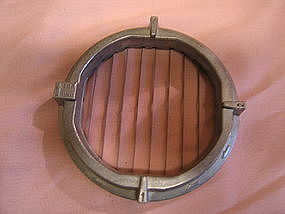 Excluding the knob, it is 5 inches in height and the width is 12 inches. There is one shallow dent and some superficial marks to the surface. I need your zip code to calculate the postage. 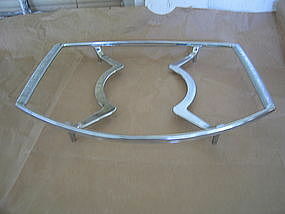 Corning Microwave Browner Grill MW-3. It is 11 1/4 x 12 inches. There are no chips, cracks, breaks or rough rim. We never used it, and there are very little signs of use. 2 are available. I need your zip code to calculate the postage. 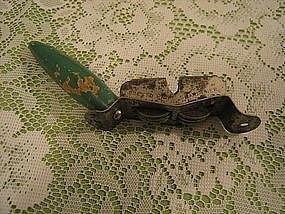 Vintage knife sharpener with green wooden handle. There is darkening to the metal and loss to the green paint. I need your zip code to calculate the postage. Vintage juice reamer or extractor. It is approximately 8 x 6 inches. It has no chips, cracks, breaks or rough edges. I have 3 of this style available and priced individually. I need your zip code to calculate the postage. 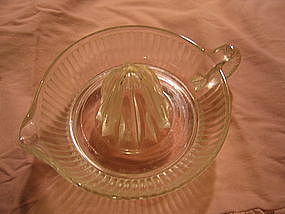 Vintage glass reamer, sometimes called an extractor. It measures approximately 8 x 6 x 2 3/4 inches. There are no chips, cracks, breaks or rough rims. I need your zip code to calculate the postage. 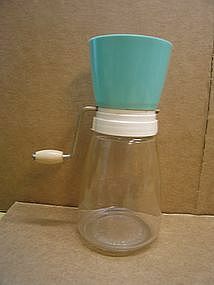 Vintage Federal Housewares nut grinder with turquoise top. 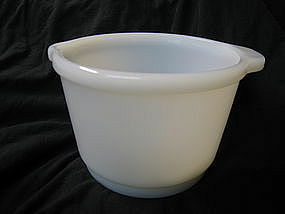 The plastic shows minor usage marks. I need your zip code to calculate the postage. Under cabinet mount jar opener marked as Pampered Chef. I believe this is one of the older versions. There is no damage, however, I've misplaced the mounting screws. I need your zip code to calculate the postage. 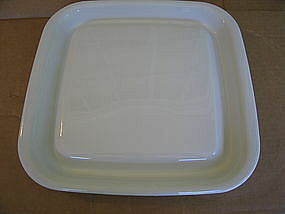 Vintage baking pan for Rival crock pot. 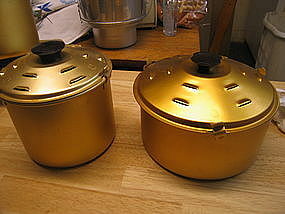 The listed pan is the taller one on the left side of the photo. It measures 7 inches in height and 6 1/2 inches in width. There are usage and cleaning marks to the surface, as well as minor denting. The aluminum these pans were manufactured in, is very fragile and easily dented. I need your zip code to calculate the postage. 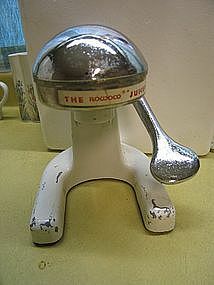 Vintage all metal Rowoco juicer. It is a manual table top style. 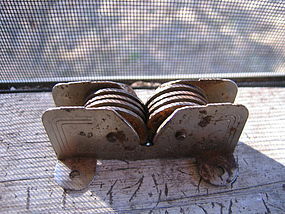 There is no structural damage, but there is loss to the finish and some age related discoloration to the cast aluminum. Complete condition photos by email. I need your zip code to calculate the postage. 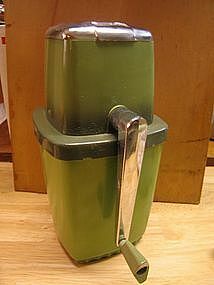 Vintage avocado green manual ice crusher. If you turn the handle to the left, the ice is fine or to the left it is coarse. Minor usage marks to the plastic base. I need your zip code to calculate the postage. 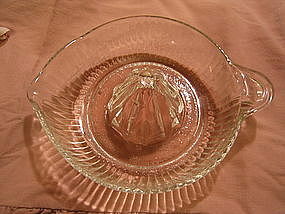 Vintage pink plastic sink strainer. There is no structural damage, but shows minor aging to the plastic. I need your zip code to calculate the postage. 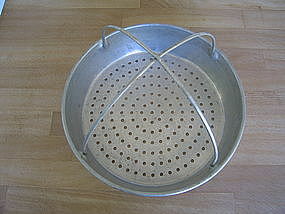 Vintage aluminum steamer basket. 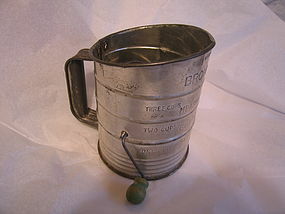 I am not sure of the capacity, but it looks like a 2 quart size. It measures 9 3/4 inches in width and 2 1/2 inches in height. There is age related discoloration to the surface. The handles are a tight and secure fit. I need your zip code to calculate the postage.